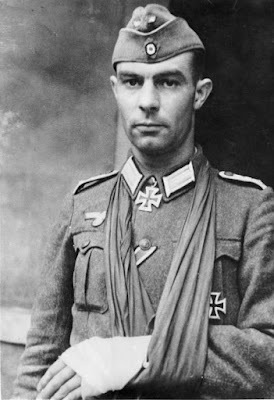 Born in Elmshorn Germany, Ohmsen would join the Reichsmarine and would slowly rise through the ranks of the coastal artillery in the Kriegsmarine. On June 6 1944, Oberleutnant Ohmsen would become the first to observe the Allied invasion fleet off the coast of Normandy. He then commanded the Crisbecq Battery to fire on the Allied fleet in which they hit several Allied ships and sunk the USS Corry. Ohmsen would then lead his some 400 men and their massive batteries in their defense against withering Allied bombardments from sea and air and from numerous infantry assaults. On June 11, Ohmsen was ordered to evacuate his position. Leaving some 21 wounded and 126 American POWS behind, Ohmsen with his remaining 78 unwounded men broke out to the new German line at Aumeville. 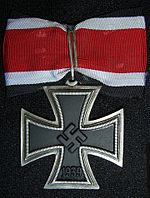 He would then be awarded the Ritterkreuz des Eisernen Kreuzes for his actions at his command on June 15. Him and his men would then be attached to an infantry unit and fight in the Battle of Cherbourg where he would become a POW and sit out the rest of the war. 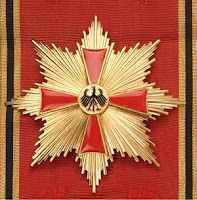 After the war he would be involved in various political and charity organizations until his death and would be awarded the Verdienstorden der Bundesrepublik Deutschland for those deeds. 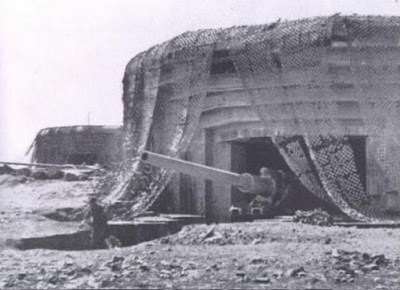 Pre-invasion pic of a portion of the Marine Küsten Batterie "Marcouf"
A brave guy to sit under all that Allied firepower and still fight back fiercely.